Thank you! A member of our team will be contacting you momentarily. We look forward to assisting you with the sale of your suite. Thank you! A member of our team will be in touch with you shortly. We look forward to assisting you with your search. Welcome to Four Seasons Private Residences Toronto. In the city where Four Seasons Hotels and Resorts was born, a residential address redefines the standard in luxury living and personalized service. Reflective of the Yorkville neighbourhood in which they reside, the residences are spacious, sophisticated, contemporary yet timeless. Within this walk-able district, admire charming Victorian facades of endless fashion boutiques, galleries, cafés and restaurants, all just steps from Bloor Street and the downtown business district. Introducing a rare opportunity at the Four Seasons. A spacious one bedroom plus den suite has arrived in one of the most sought after buildings in Toronto. Schedule your complimentary tour through the link below. Wholly owned properties, designed and built to the Four Seasons standard. In the highly sought after Yorkville area of Toronto. Your luxury residence includes access to renowned Four Seasons service and amenities. With a promise of effortless hotel/resort-style livingm daily life is enhanced by feelings of relaxation, efficiency and exclusivity. The first twenty three floors have 259 hotel rooms with the condominium suites located above. 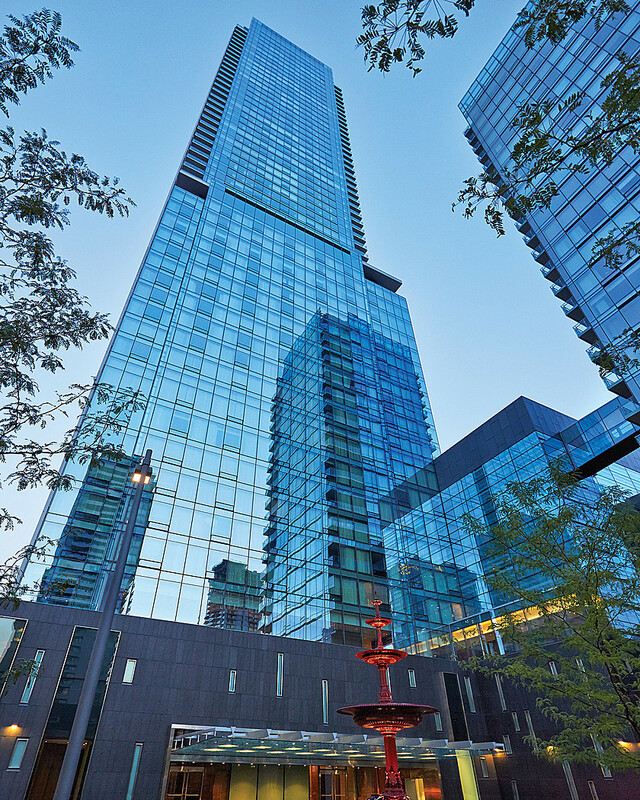 Residents of the Four Seasons Yorkville condos have a private, discreet entrance and lobby separate from the hotel, located on Yorkville Avenue. A maximum of four suites per floor, each residence is individually accessed via direct elevator service from the ground floor lobby and there is also a separate service elevator controlled by security. Suites feature terraces, gas fireplaces, minimum ten foot ceiling heights, cornice mouldings, full height curtain-wall window systems, central vacuum and include two parking spaces and one locker. Heat pumps provide multiple year around heating and cooling zones within each unit. Suites sizes start from the two bedroom floor plan of 1,956 square feet and goes up to the exceptional 9,038 sq ft penthouse. As a residential-only building, residents of the Four Seasons Yorkville have a separate entrance and lobby on Scollard Street. Residents access hotel amenities including the spa and fitness centre located in the West Residence building via an elevated pedestrian bridge on the 9th floor at 55 Scollard. A lush courtyard park, shared by both buildings, fronts on Yorkville Avenue and is accessible from Scollard Street. Suites feature balconies, minimum ten foot ceiling heights, cornice mouldings and include one parking space and locker. Heat pumps provide year around heating and cooling. Suites sizes range from the one bedroom floor plan of 1,100 square feet to the largest suites of over 5,000 square feet. Relax into the sleek, contemporary comfort of Four Seasons Hotel Toronto. Our 253 spacious guest rooms, including 42 luxury suites, offer modern furnishings in a soothing, neutral colour palette, and feel like chic private residences in the heart of Toronto’s fashionable Yorkville district. Are you looking to purchase or sell a suite at the Four Seasons? It would be our pleasure to assist you.